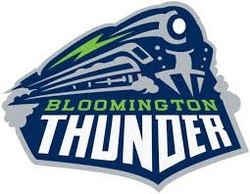 Saturday, April 9 at 7:00 P.M.
Join the Social Committee for an exciting night of hockey when playoff-bound Bloomington Thunder take on Chicago Steel. This year’s Thunder team is setting league records for scoring. Center ice tickets, $10 per family / couple or $5 for a single ticket. Concession voucher included. Register below. RESERVATIONS AND PAYMENTS MUST BE RECEIVED ON OR BEFORE APRIL 1ST. NO LATE REGISTRATIONS WILL BE ACCEPTED FOR THIS EVENT. Financial Hardship Policy: The McLean County Bar Association will waive the cost of the meeting and luncheon to anyone showing need thereof by direct application to the President of the Association. Please contact Eitan Weltman if financial assistance is needed.